This is copied from a previous comment I posted on another site. I haven’t seen many people picking up on this point, with so many points to be sorted out from the debate. This part of the debate was a total set up. 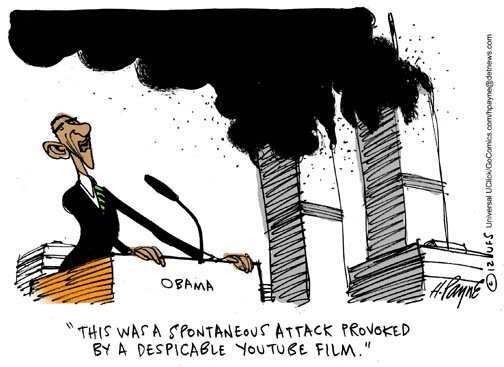 O makes his statement about his having called it a terrorist attack in the rose garden, baiting Romney. As Romney responds, O sits back on his stool, takes a drink and watches with his smug look, tells Romney to go on,……then says to Candy, “the transcript” and she immediately pulls it out and refers to it. All on cue. Even after the debate, she is clumsily making an excuse for why she had the transcript even without being asked, (paraphrasing) I knew the Benghazi situation would come up so I was doing some reading on it to prepare for the debate. Now, she had many previous comments on this whole thing on CNN, she didn’t really need a refresher course as though this was months ago and she was fuzzy on the whole thing. Total SET UP!